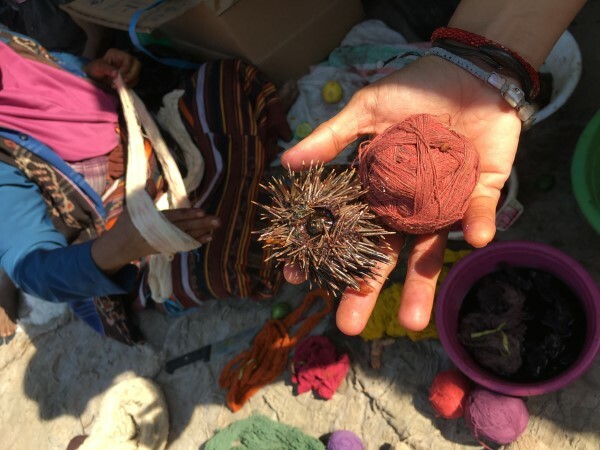 This blog continues my experiences of the textile research trip to the Lesser Sunda Islands by Sea Trek. We sail east from Floes. There’s a map on the previous post. 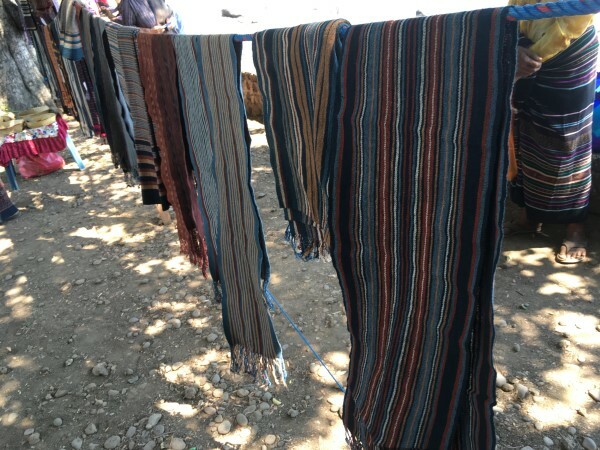 At Bama on Adonara Island we saw more ikat dyed indigo and morinda. This ikat was decorated with sea shells. 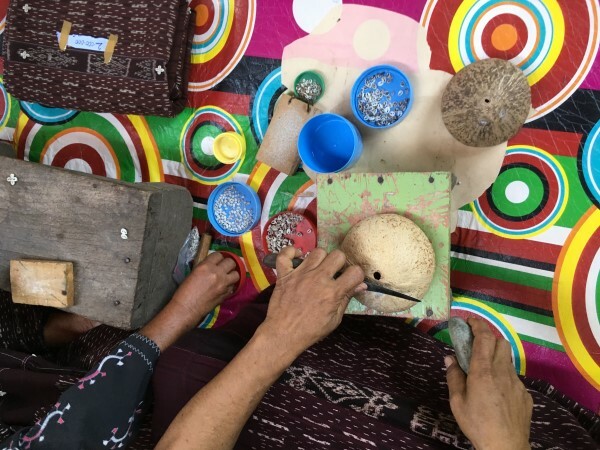 The shells are placed in the eye of a coconut and the top sliced off before being stitched onto the cloth. 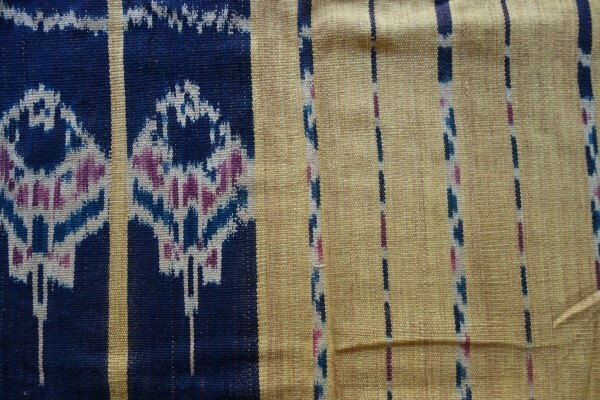 An overview of textiles produced.The ikat stripes are very fine. On Lembata we visited Mawa and Dikesara* (I had this noted as Lowelain). Here was a case of how living in a actively volcanic region influences life. At Mawa village, there is no drinking water as it is very high in sulphur. Water is imported. 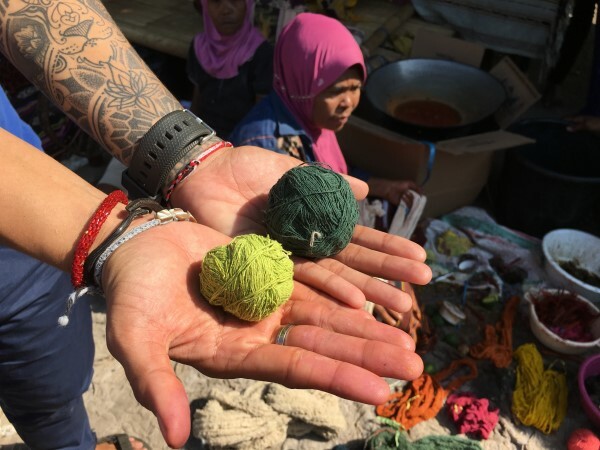 Imported water is also used for dyeing though we told that the local water gives yellow on yarn. 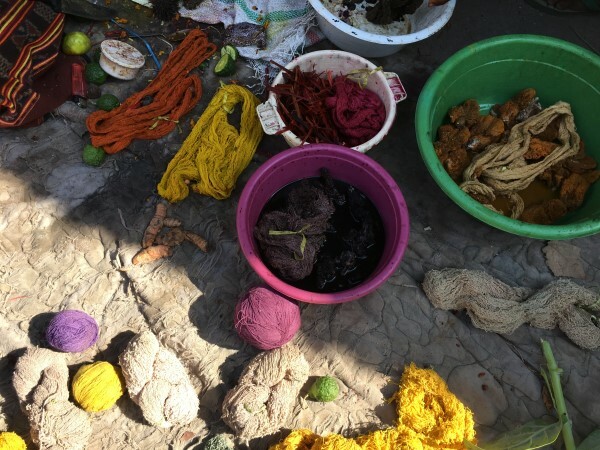 The dye pots used come from another village. They are bartered for corn, textiles and cocoa. Perhaps the pots are also full when they arrive. 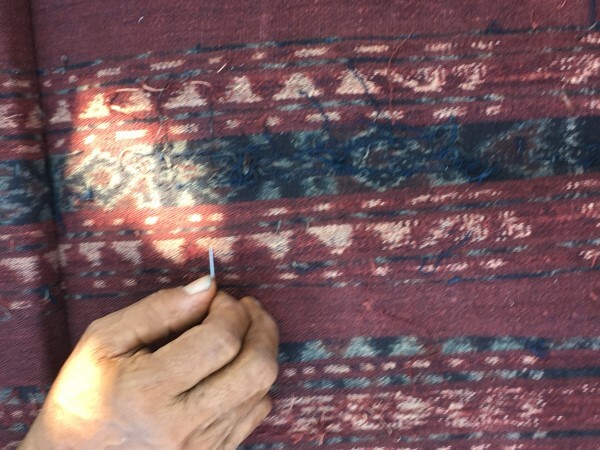 We also saw more broken threads in weaving. 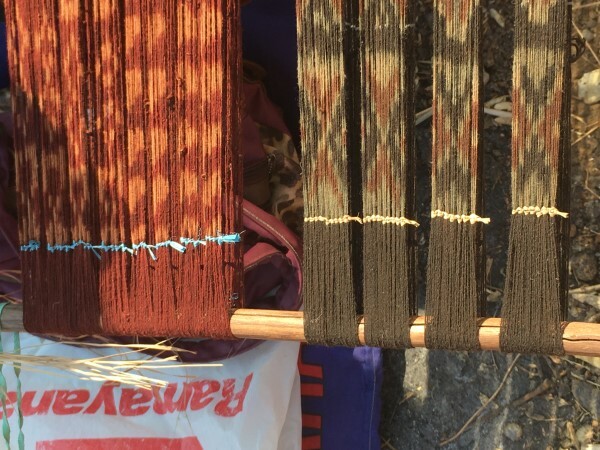 Is this a case of seeing less experienced weavers or weaving with no sizing to help strengthen the handspun yarn or does the atmosphere or water if it has been used create weaker threads? There were some very beautiful warp striped fabrics here. 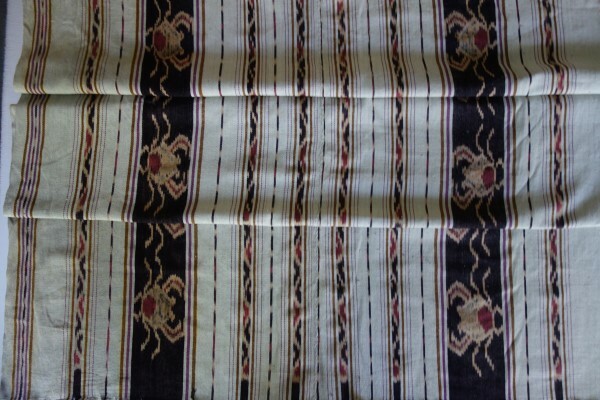 Dikesara had similar textiles. I think that it was here that when they changed the water pipes, the dye colours also changed. The colours are more “earthy”. These are all those broken warp threads I referred to. What a delightful way to go shopping. Yes that’s the sea in the background. 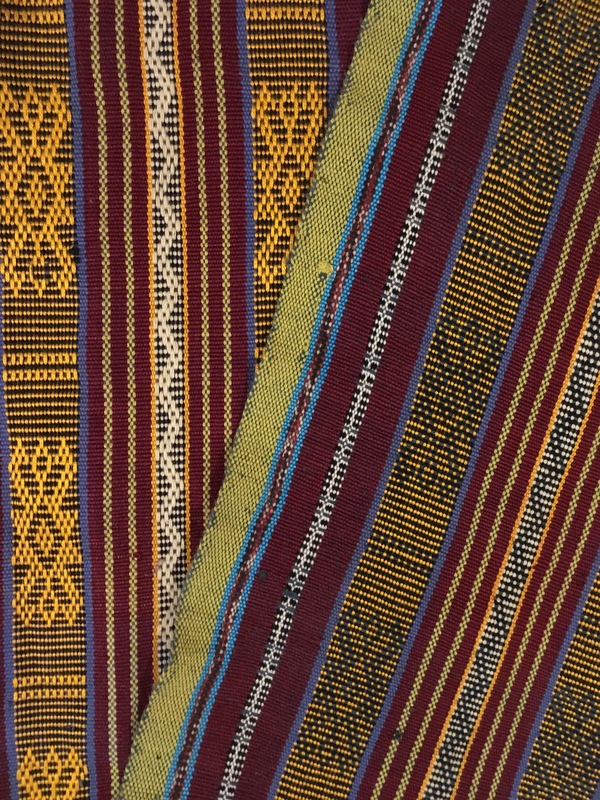 A more detailed look at stripes and combinations of ikat patterning in one textile. What a colour feast awaited us at Uma Pura on Ternate Island. Up to now we’d seen predominantly morinda and indigo with an odd spot of other colour, but here was a magnificent array of colour. 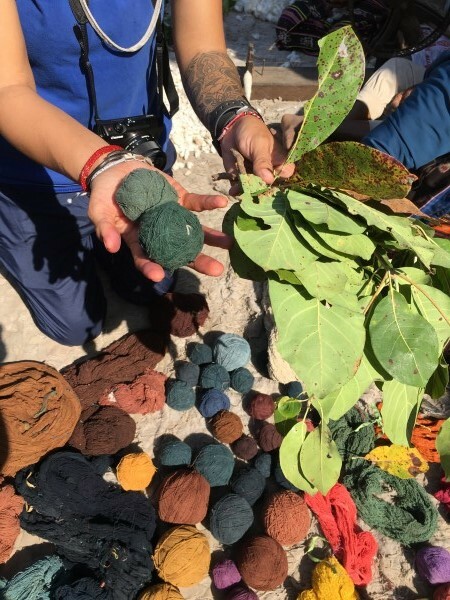 All were natural dyes, some obtained by plant matter with others from the sea. Another group dyed yellow from turmeric, milk weed leaves and candlenut. Pink from the bark of the hong tree. It has very hot water poured over it 5 – 6 times to get the deepest colour. Bone (front) from sea weed or sea grass. Rose brown comes from the sea hare. 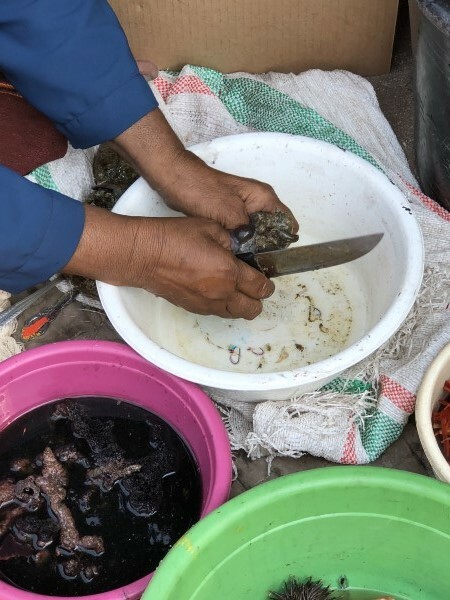 The sea hare is shown at the back and yarn is being dyed in the dish at the front. You may also see it in the image above. This orange/brown from a sea urchin. Beige from the castor plant leaves. Dark green from the Indian Almond tree + indigo. 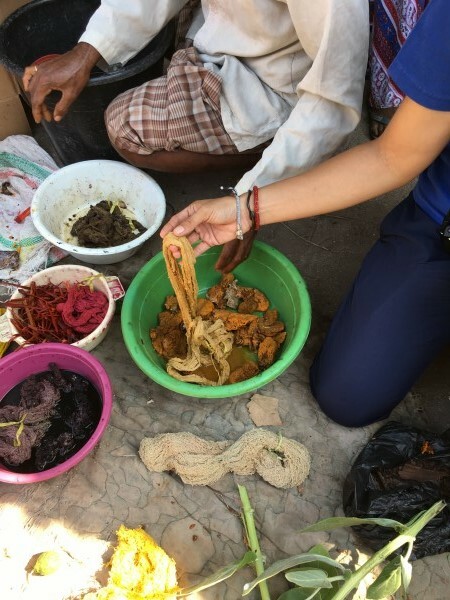 Mustard is from the jack fruit bark. Blue is of course indigo. Black is from indigo + lime. Dark brown from morinda and candlenut. Bright green is from the Indian almond tree. Here’s a comparison of the two greens. This deep purple came from the sea sponge. The sponge is beside the yarn. 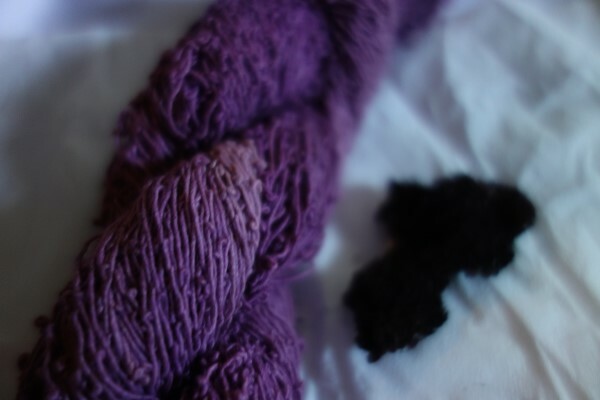 Here’s a couple of interesting additional information on dyeing. Men must not be involved in dyeing with indigo. It will affect their fertility. Dyeing must be done during daylight hours. The dye baths must be taken in at night or “the moonlight will change colour”. 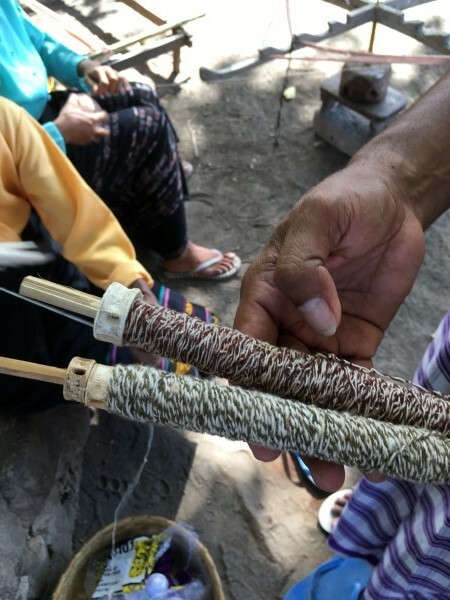 There were 5 weaving groups represented here with about 20 members in each group. Lines of interesting textiles with various colours and imagery were stretched around an oval. The imagery was also reflective of life by the sea with various sea creatures: whales, sting rays, fish, crabs, turtle though there were other more “usual” styles of imagery too. The Kalabahi Museum was the highlight of our visit to Alor Island. The museum had a wonderful collection of textiles all displayed in glass cabinets though the staff were more than willing to open these doors for us. 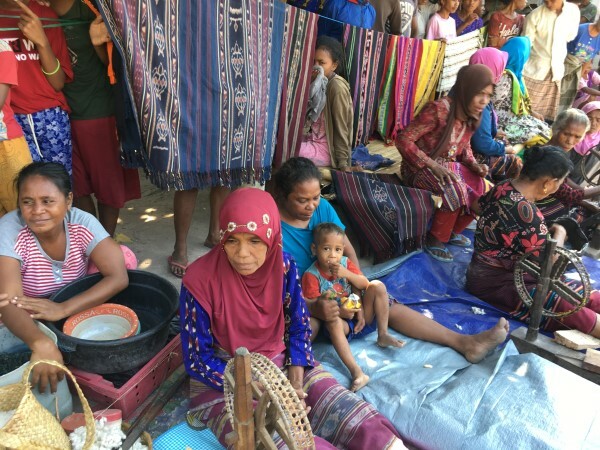 On our arrival at Tama (Tamakh*) on Pantar Island, everyone was presented with a scarf; all different. Usually it is just the representatives of the group who receive one if at all. I am delighted with mine, not because it is a wonderful piece of craftsmanship but because it is a true weavers delight. Here is a scarf that obviously combines a whole lot of leftovers: hand spun (yellow) and commercial cotton, natural and synthetic dyes all overlaid with a bit of patterning. It’s something that I might do to use up all those odd ends. The pattern is a result of creating warp floats (weft on the back) on alternately coloured warp threads. 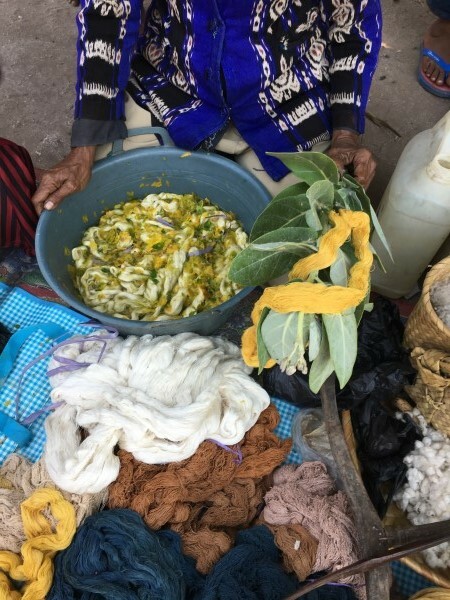 The locals trade textiles as there is none made in the village. 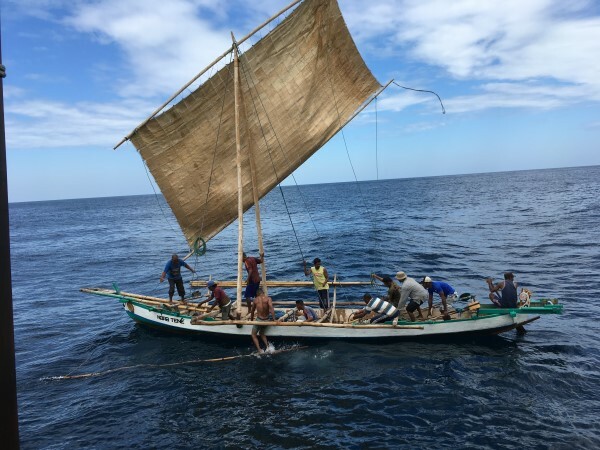 Lamalera on Lembata Island is a whaling village where whaling is done from small outriggers. Another aspect of textiles in daily life is shown here. 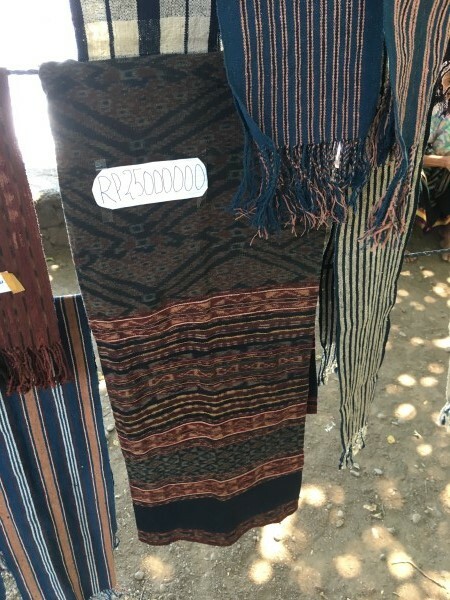 The sail is hand woven. However there are also textiles produced here. 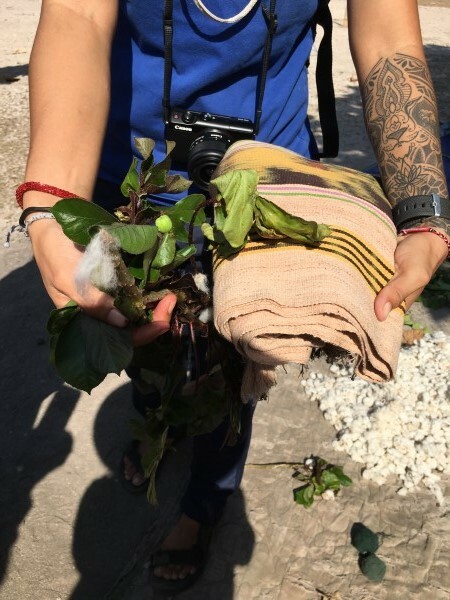 Naturally coloured cotton is grown and spun. 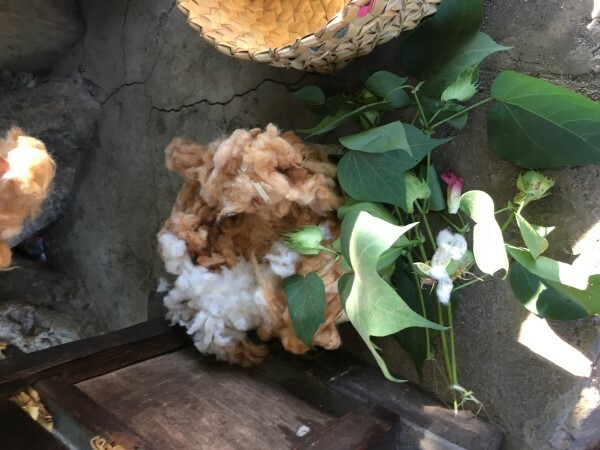 This is the first time that I saw plying of cotton being done. 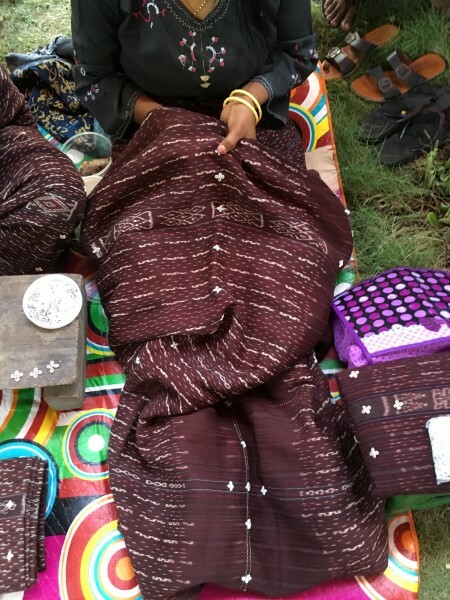 It is used as a decorative stripe in woven fabrics. One ply is natural white cotton, the other is a naturally coloured or dyed cotton. Note the end of the spindle is a whale bone. 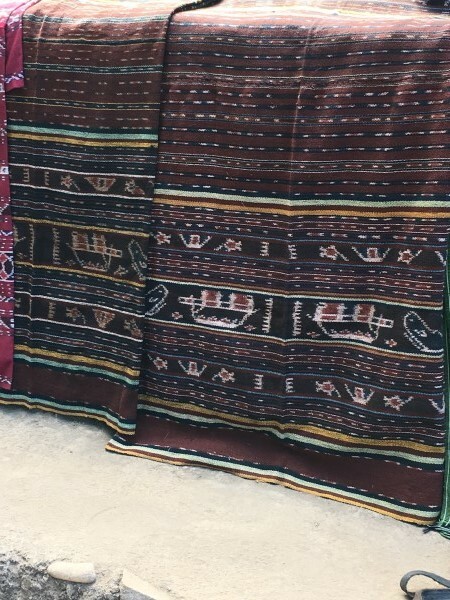 Whales and boats did feature in some of their textiles. We’re back to a more limited colour way. 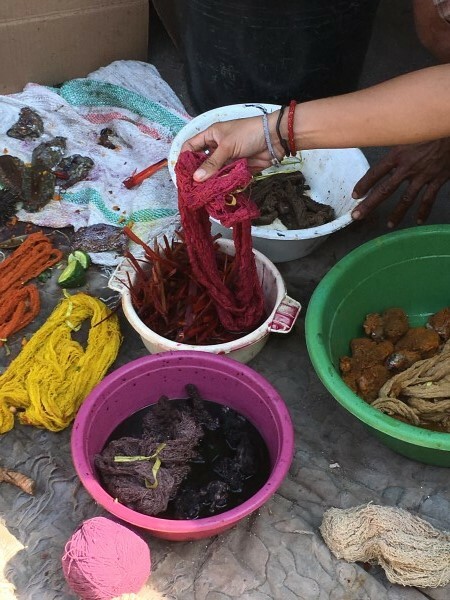 The dye demonstration showed red (morinda), blue (indigo) , yellow (turmeric) and green being produced. The next stop: The limestone islands of the Lesser Sunda group. 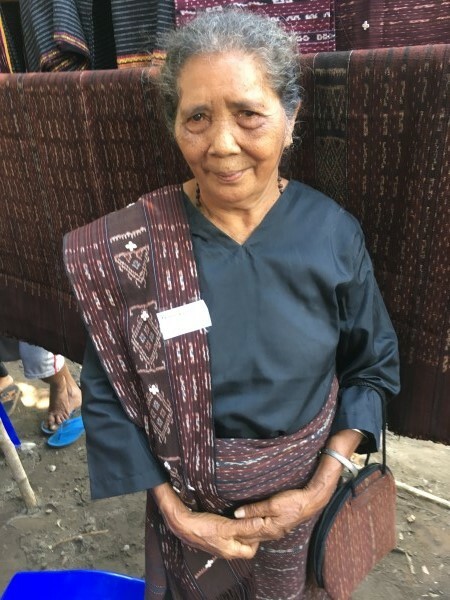 This entry was posted on Wednesday, June 20th, 2018 at 11:47 am and is filed under Back strap weaving, Dyeing, Ethnic textiles, Indonesia, Natural dyes, Textiles inspired by travel, Textiles of Indonesia, Traditional weaving, Travel, Uncategorized, Weaving in general, Weaving in the Lesser Sunda Islands. You can follow any responses to this entry through the RSS 2.0 feed. You can leave a response, or trackback from your own site.